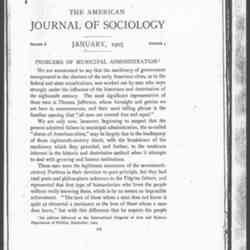 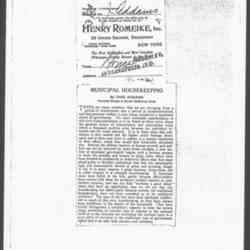 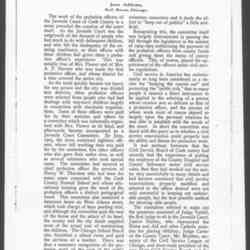 Shaw writes Addams about the papers to be read at the municipal government conference. 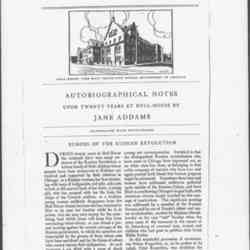 Addams finds the causes for breakdowns in municipal administration in eighteenth century idealism that foundered against nineteenth century increases in population, industry and commerce. 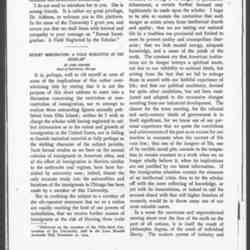 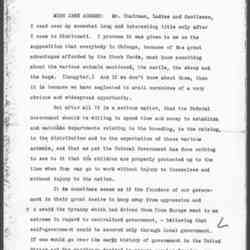 This speech was originally given on September 25, 1904 at the International Congress of Arts and Sciences in St. Louis, MO. 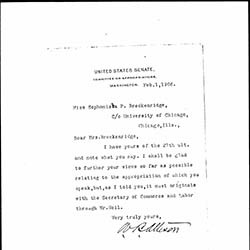 Addams delivered this commencement address at the University of Chicago in December 1904. 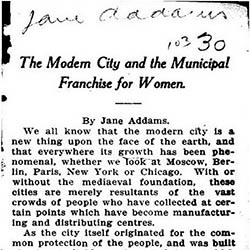 Addams finds the causes for breakdowns in municipal administration in eighteenth century idealism that foundered against nineteenth century increases in population, industry and commerce. 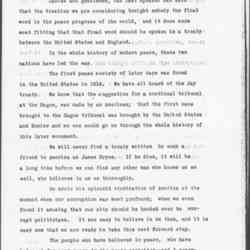 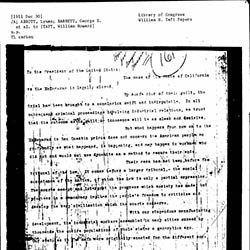 The speech was originally given on September 25, 1904 at the International Congress of Arts and Sciences in St. Louis, MO. 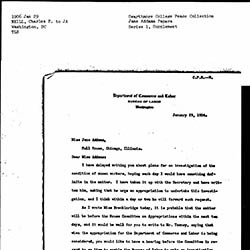 Neill updates Breckinridge about the status of getting funding for the women's labor study, suggesting that Addams should testify before the Congressional Committee. 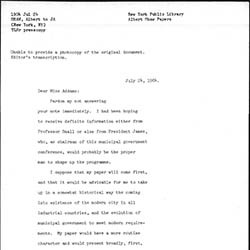 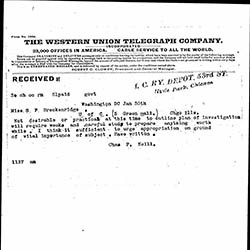 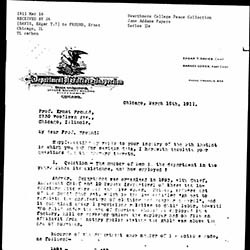 Neill telegrams Breckinridge that he thinks it best to secure an appropriation for a study on women workers before created a detailed plan. 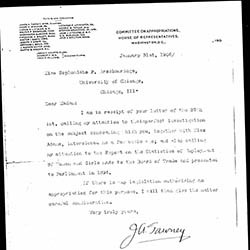 Tawney confirms that he will consider a study of women's labor and appropriation authorization is approved. 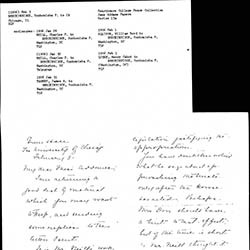 Allison offers to help with passing an appropriation for a study on women and labor, but notes that it must come from Charles McNeill at the Department of Commerce and Labor. 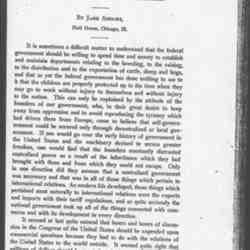 Lodge agrees to assist Breckinridge with her study of women's labor. 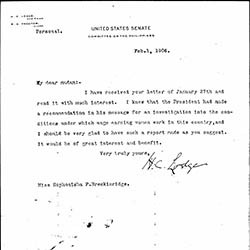 Breckinridge returns some materials about the lobbying for an investigation of working conditions for women and discusses the status of the work. 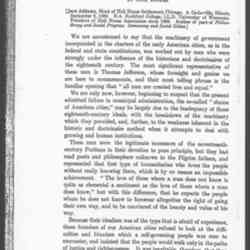 Addams discusses the experiences of Chicago probation officers and the profession of civil service. 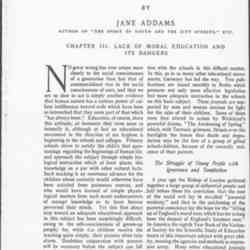 Addams discusses the shift from industrialism to humanism. 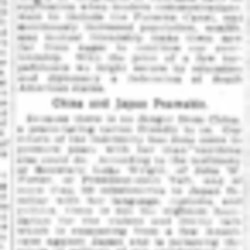 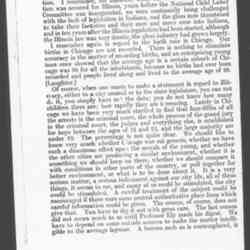 Description of the November 26, 1906 City Council meeting on the question of widening Halsted Street, which ended in a draw. 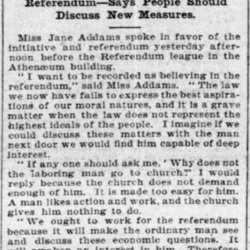 Addams discusses the responsibility of the State for the public health and sanitation and child labor. 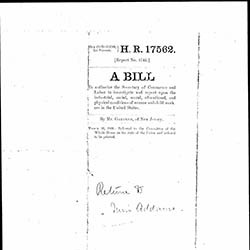 Addams led a contingent to oppose efforts to exclude child actors from child labor laws. 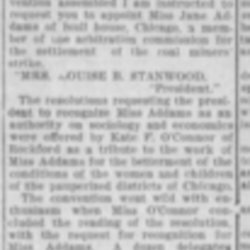 She testified before the State Senate committee considering the bill, along with Will J. Davis (speaking for the bill), Mrs. Coonley-Ward, Mrs. A. T. Aldrich, Margaret Halsey, and Anna Nichols. 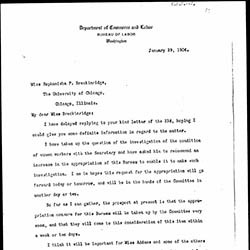 Davies sends Freund some data regarding factory inspector budgets, manpower, and numbers of inspections from 1893 to 1910. 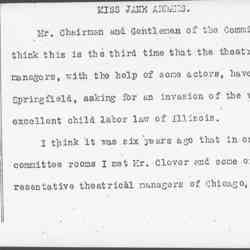 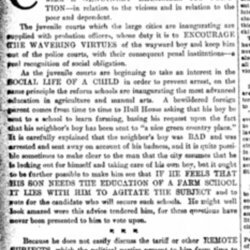 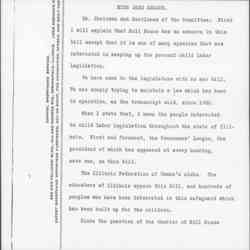 Addams' testimony before an Illinois State Senate committee as the leader of a contingent to oppose legislation in Illinois that would exempt child actors from the state's 1903 Child Labor Law.